Making the most of your life and relationships! STEP ONE in "Building your life around love." VISUAL REMINDER: Your first finger can remind you to LISTEN. STEP TWO in "Building your life around love." 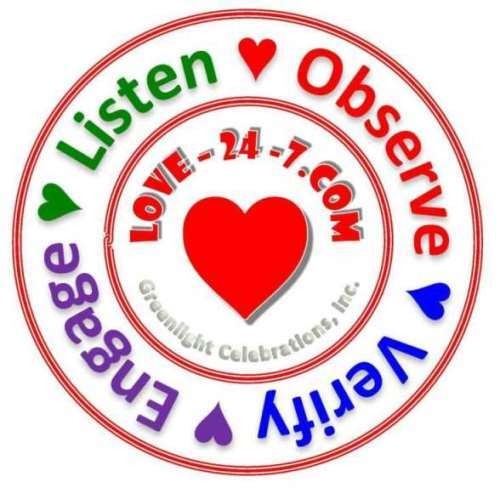 ♡ Loving displays value through OBSERVING needs. VISUAL REMINDER: Your second finger can remind you to OBSERVE. STEP THREE in "Building your life around love." ♡ Love VERIFIES that our actions reflect unconditional love. VISUAL REMINDER: Your third finger can remind you to VERIFY. STEP FOUR in "Building your life around love." ♡ Loving chooses to ENGAGE in positive ways. VISUAL REMINDER: Your fourth finger can remind you to ENGAGE.